It’s another frigid night on the North Shore, and you’re in the depths of the winter doldrums. You’re contemplating grabbing your suitcase and wait listing yourself on the first flight south. Not a bad idea, but we’ve got an easier solution for you: head for Passports where warm popovers, a convivial atmosphere, and a creative menu will cheer you up in no time. 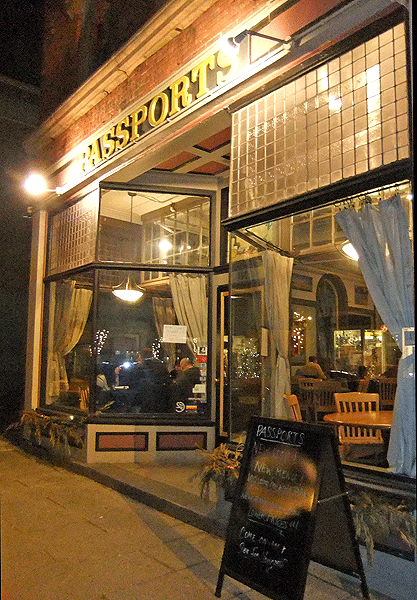 We had a great meal last weekend at this popular Gloucester spot. There were tons of hot and cold tapas to choose from, followed by entrees that were far from run of the mill, and everything was extremely reasonable. After sipping some wine (no hard liquor is served) and enjoying the aforementioned popovers, we chose three tapas. The thai duck ($9) was a large breast cooked to our requested medium rare, tender, and flavorful. The grilled curried vegetables ($5) also had great flavor, but the spanish omelet ($4) could have used more seasoning. Unusual combinations were the theme of the entrees, a welcome sight in the midst of this gray season. They were all successful, too, from the yellowfin tuna stir fry ($17) with bright vegetables to the mandarin scallops with sweet potato casserole ($17). 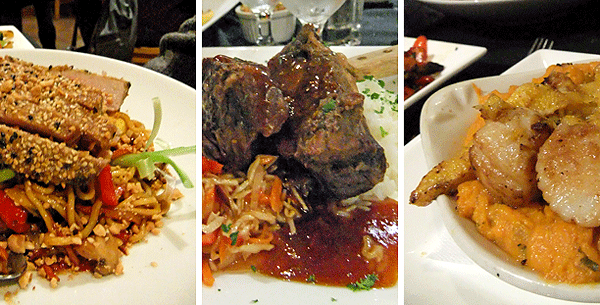 The flame-broiled lamb ($20) has three sauces to choose from, and we were glad we went with the earthy wild mushroom. Short ribs are not usually associated with asian cooking, but the sweet/sour/salty combination offset the rich meat perfectly ($15). We were plenty full from dinner, but to gird ourselves for the cold trek home, we indulged in a brownie sundae and an apple crisp, both $6. The crisp had good flavor but was more cake-like than crisp. The brownie was the better pick: fudgy and not too sweet with hot fudge and whipped cream.